Yes, it’s been awhile! I got so busy with all of our 30th Anniversary events, including writing the text and choreographing our 2015 premiere that, needless to say, the retrospective blog articles got set aside. But…I’m back! Dancers that season were Katie Ball, Suzie Bulger, Teri Copeland, Carol Ernst, Robin Peters, Sophia Thomas, Maureen Welsh, and myself. 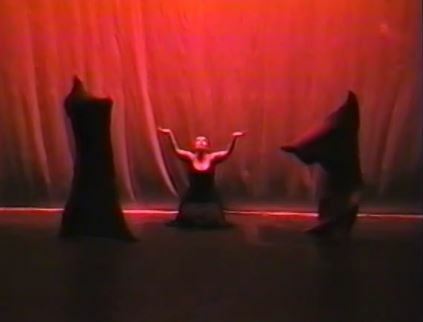 Cycles of the Moon was exactly that, a series of dances that evoked the spirit of each lunar phase through movement. 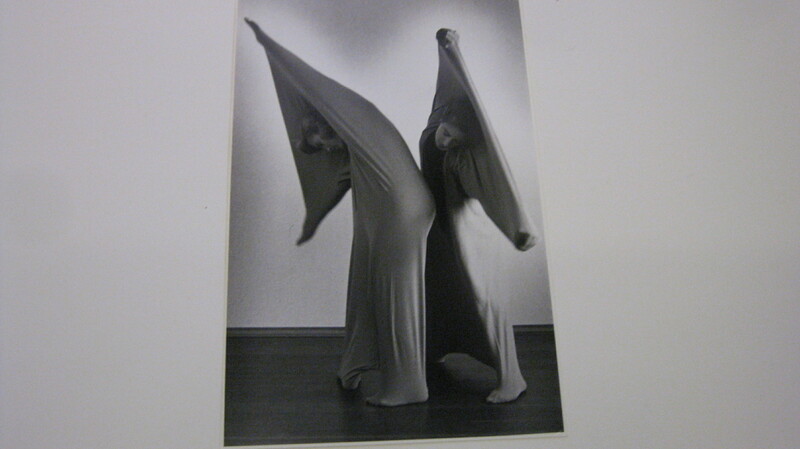 Crescent moon / Maiden moon was danced by Katie Ball and Robin Peters, as you’ll see in the photos… Other phases included Waxing Half Moon, Full Moon, Waning Half Moon, Last Crescent, and Dark Moon which was always my favorite. Set to music by Giorgio Moroder (the Dark Moon section) we wore these feathered head pieces made with sections of black boa that trailed down the back a bit like long hair. (Still have them in the costume closet at the studio). Less Concept / More Dance was very tongue in cheek and actually quite funny. It was however one of the pieces that was much more theatrically oriented than strictly dance. The section entitled “Business & The Arts” featured half the dancers speaking business phrases while dressed in suit coats and ties and half the dancers in romantic tutus and pointe shoes calling out statements about the wonders of the arts. When their dialogue threatens to evolve into a shouting match, one of the “arts” dancers coyly states “tax deductible contribution” whereupon the “business” dancers carry them off in ecstasy. One of my other favorites from this section was “Organic Food Isn’t for Everyone” …In retrospect, it is really pretty crude in its execution but the audience thought it was funny if you judge by the laughter which is still very audible on the old VHS tape. 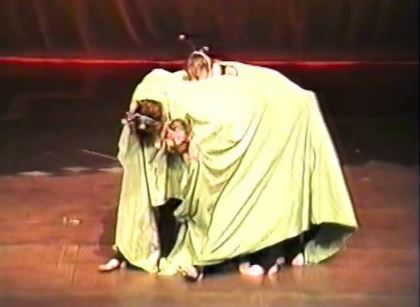 A weird monster (several dancers covered in a very large sheet) accosts a hippie (Sophia Thomas) who is dancing about the stage with a bouquet of daisies and eats them both. It then regurgitates first Sophia and then her flowers. The final piece of this concert,Children of a Common Mother, was about our inability to live peacefully with other species and featured… stretch bags! They were used by (Robin Peters and Sophia Thomas) which allowed me to tell a creation story and have new beings brought to life and then killed by human beings. Sigh… definitely not as subtle as it might have been. And yet, it is what people (as a species) tend to do. The concert was a good example of something I tended to say in those days… that I never wanted anyone to be too sure of what they might see at a PTDT concert. The pieces ranged from technical proficient and lyrical to the theatrical and idiosyncratic, using a diverse range of movement vocabularies. All three had pretty different looks to them, as the photos demonstrate. Less Concept / More Dance…which ironically it wasn’t!